California’s housing crisis has emboldened grandstanding Sacramento politicians who measure their own “success” by the number of bills they can pass with their own names attached. We now have Scott Wiener’s SB827, a bill which would use “mass transit” (defined as four buses an hour during rush hour) to eliminate local governments’ ability to zone single-family housing and to replace locally crafted General Plans with increased density levels dictated by Sacramento politicians. SB827 would effectively eliminate any protections for single-family housing in cities and allow developers to build up to ten-story buildings without any input, control or recourse from local communities. It’s the Developer Industrial Complex’s dream come true. Wiener’s SB827 is the absolute wrong prescription to deal with the housing crisis. Despite Wiener’s attempts to blunt criticism by making some cosmetic amendments to SB827, the bill continues to be opposed by a wide variety of diverse communities and social justice organizations such as the Crenshaw Subway Coalition. And last week, the LA City Council, hardly a bastion of reaction, rejected it by a 13 to 0 vote. So who’s backing Wiener’s bill? It’s the oddest combination of special interests and committed densifiers, many of whom have banded together under the moniker of “Yimby,” which wittily and ingeniously changes the pro-density pejorative “Nimby,” “not in my back yard,” to “yes in my back yard”. On the one hand we have hardline Ayn Rand “free market” property rights advocates, who in principle oppose government regulation; on the other hand, we have radical ideologues, who think zoning is inherently “racist” and that opponents are selfish people who want to exclude people from their neighborhoods. Wiener’s bill seems to have created a curious case of “intersectionality,” including Cliven Bundy-style radical libertarians and those partial to Soviet style top-down planning. Although sometimes characterized as a product of the left, the “Yimby” movement is largely funded by Silicon Valley billionaires who seek to cram tech workers into expensive multi-family housing as well as developers who don’t like pesky zoning restrictions or environmental protections. The alliance of developers and tech oligarchs look to Yimbyism as a means to eliminate zoning and environmental restrictions in order to increase profits. Should it surprise anyone that developers and developer interests represented the largest donor base to senator Wiener? Sonja Trauss, a professional Yimby who runs San Francisco BARF (Bay Area Renters Federation), openly endorses indiscriminate building, fiercely defending the rights of “those who haven’t moved to the Bay Area yet.” Her notion is based on a simplistic supply-side argument which argues that we can somehow build our way out of the housing crisis and into affordability. Trauss and her supporters seem unconcerned that, given the costs of constructing multifamily housing, particularly in coastal California, this will likely increase new luxury housing. The theory is that the luxury housing would relieve the pressure for this market sector and ultimate filter down to create affordability. These “trickle down” theories are singularly ill-suited for application to the housing crisis. For one thing, they don’t consider the phenomena of absentee landlordism and speculation. How many foreign investors, for example, might purchase condos for speculative purposes or as second homes which they might occupy for only a few weeks a year? Trauss’s “build, baby, build” pseudo-solutions fail to take into account the demonstrated results of densification by design. The most unaffordable markets in Australia, Canada, Great Britain as well as the United States are those that are generally densest and, in many cases, prevent construction of housing where it is most affordable --- the periphery. Yimbys are not as interested in stabilizing the system and solving the crisis for those who already live here but in creating housing for future residents. In fact, Yimby anti-zoning policies lead directly to the displacement of existing residents, including many lower income groups and minorities. Wiener’s bill, rather than a boon for affordable housing, is a potential bonanza for well-placed developers. 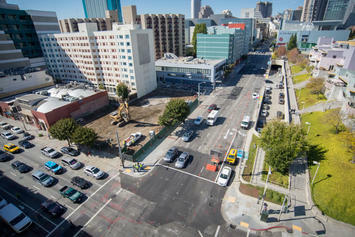 Developers hate having to pay for parking for their projects. Check that: SB827 eliminates parking requirements near bus stations, even if public transportation, compared with driving, takes triple the amount of time to get from Point A to Point B. Developers hate design review, as they don’t want to be bothered with such niceties as aesthetics. Check that: SB827 eliminates design review requirements. Developers hate to enter into development agreements with municipalities, which would provide for additional public benefits, including funding necessary to provide services. Check that: SB827 gives them by-right development rights, representing an exponential increase in property values and profits – all without having to negotiate additional public benefits or give municipalities an extra nickel. This comes at a time when cities are notoriously bad at extracting benefits from developers whose profits they enable. Rather than look to strengthen cities’ ability to make good deals with developers, which would create revenue cities could use to provide residents services or even build affordable housing, SB827 literally gives away the game away by taking away their leverage. In fact, by taking zoning out of the hands of municipalities, SB827 will also cause cities to incur significant additional expenses in the form of more staff needed to serve more residents, just for starters. The scraps from the table which municipalities would receive in the form of some fees and taxes would in no way counterbalance the additional expenses. Ultimately, the whole notion of TOD (“transit-oriented development”) which is the main rationale for SB827, is itself a backward-looking mid-20th Century concept, which ignores developments in technology and advocates transit “solutions” which could soon be obsolete or, at best, second-best. Communities and regions should instead look to 21st Century transit and urban models such as AOD (“Autonomous Oriented Development”), which look to the ways in which technology can and will impact commuting patterns and even the notion of commutes themselves. In fact, some of the decreasing ridership in LA’s MTA system has been explained by poor people, including illegal immigrants who now can get drivers’ licenses under state law, and who now are moving away from expensive areas near transit and themselves abandoning public transit in favor of driving. This is no small wonder since public transportation can often take exponentially more time to reach a destination even in the worst LA rush hour traffic. Ultimately self-styled "progressive" senator Wiener is pushing for the single largest wealth transfer in modern California history for the benefit of wealthy developers. So, with Scott Wiener, at least, the word "progressive" actually means: "regressive." We are truly living in a world which would put Lewis Carroll to shame (not to mention Orwell and Huxley). The irony of this statement is that most of the people who actually live in our City today were excluded from doing so under the covenants which were in effect in the very early years. Some things, thank goodness, do change for the better. Clearly, actions speak louder than words: SB827 could eliminate more than 90% of single-family housing in San Francisco, more than 50% in Los Angeles, and a figure somewhere in between that in Beverly Hills, literally destroying many communities. “Community” with a capital “C” is the most elemental form of human beings coming together to live among one another; the concept of Community is an extension of the concept of family. SB827 would not only destroy Beverly Hills, but a multitude of unique communities throughout the state. But, hey, at least ideological purity would be served by eliminating much of that “racist” form of housing. Ideological purity is why Wiener and the radical Yimbys would burn down all urban planning theories which don’t conform to their own notion of density. They are convinced that only their level density is the only “right” way to live and would impose their dogma on everyone else by force. At its core, that’s what SB827 is about. This kind of ideological Yimbyism is marked by a complete lack of tolerance about divergent views or lifestyle choices. It represents an urban planning form of totalitarianism – or Soviet-style master planning at its finest. A humanistic urban planning perspective, on the other hand, accepts that people are individuals and respects that individuality by embracing a multitude of living options. From single-family housing to ultra-dense, Manhattan-style living, along with everything in between, humanistic urban planning offers choice and diversity. Far be it from Wiener & Co., their corporatist sponsors or academic boosters to look at people as dynamic, living, breathing and, yes, individual human beings, who go on to form dynamic, living, breathing and, yes, individual communities. For them, all too often, human beings seem to just widgets, stats or marks. But cities are in many ways like human beings themselves. And the best, most successful communities develop and grow organically. Once a community has reached the urban planning version of its ideal height and weight, it can continually try to improve and regenerate itself. It can improve roads. It can add municipal fiber (something that Sacramento politicians are now trying to ban). It can replace failed buildings while protecting character-defining ones. It can work out rules to stabilize rents and encourage continuity. But if outside forces, like zealot planners or politicians with an agenda, attempt to force feed the community, if they shove forced development down the community’s throat, then the community will become bloated and unhealthy, and its arteries will clog. If Scott Wiener and his Yimbys were really interested in solving the housing crisis they would fight to bring back redevelopment agencies which could fund truly subsidized housing. They would help empower municipalities to share substantially in developer profits and to use the funding generated to create truly inclusionary housing. And, overall, they would try to create a nexus between job magnets which create a demand for housing and those corporations profiting from the growth. He’d get his Silicon billionaire buddies and their corporations to step up and pay for housing in cities and communities which would welcome the investment. But Scott Wiener, his Yimbys and their Big Developer allies aren’t really interested in solving the housing crisis. They’re interested in profiteering from it. And they don’t care if they have to destroy communities to do it. since 2009, including as mayor in 2013-2014 and 2016-2017. He created the City's Sunshine Task Force in 2013 to increase transparency and public participation in local government. Regardless of highly visible "Silicon Valley" support for SB827 and similar state-level efforts and laws to force densification on California single family zones--such laws may begin the GREAT EXODUS of major corporations, private-family business, wealthy and middle class households out of the state. Any economic decline in California will negatively impact support for and progress on green space development and ambitious environmental goals in both California and the nation as a whole! Very high tax and regulatory burdens (many I personally support!) so far have not led to such an economic and social decline--but forced densification bills like SB827 will negatively impact venture capitalists, college professors, CEOs, business owners and countless others literally where they choose to live with their families. State-level central control forced densification laws like SB827 will sever/break this last binding attachment to long term residency in the State among an irreplaceable critical mass wealth and economic resources--first a trickle then mass exodus and economic decline from a "self-inflicted wound" imposed on the people by arrogant state leadership. Once the negative consequences (or "BLESSINGS" from a Texan perspective as they will enjoy benefits) are realized and set in motion they will be very very hard to reverse. Perhaps a voter-rebellion led anti-densification initiative(s) could save the state from the damage of these proposed laws! Otherwise with the exodus/decline the debate shifts to which states--including Texas, Washington, Oregon and Colorado--will benefit most from the Great State of California's stumble. What high tax burdens and regulations failed to wreck and disassemble--overreach in the form of forced densification laws may ultimately set in motion (and the Texans cheer!). The Population Bomb that fizzled.